Hello blog friends, I have been working on the men's knit scarf a little bit each day and I have made some progress on it and I'd love to show you. I decided to add grey yarn to the scarf as I think the scarf needed a little bit of contrast. To see the beginning of my work on the knit scarf you can see it here. The grey yarn that I am using is Great Canadian by Bouquet and the yarn is made in Canada. My mom gave me this yarn to use a while ago and I'm using it now for the scarf. I love afternoon coffee to keep me going through the day and I love using my Dunkin' Donuts mug! I plan on making the scarf at least 60 to 65 inches long and I'm hoping I will have enough yarn to work with. I figure if I work a little bit each day on the scarf then it won't be so overwhelming for me. I really like the way that the scarf is coming out and I'm using the grey yarn to make a stripe effect. I learned how to use a circular knitting needle from watching some YouTube videos and I find it a little bit easier with holding the needles. I find the YouTube videos very helpful and I even learned how to add different colored yarn by watching them and how to weave in your ends of yarn. You can click here to see where I may be partying this week. I am on Google +, Twitter, Ravelry and Pinterest. My username is @brklynhousewife. Please don't forget to follow me on Bloglovin too! All of my crochet/knit creations and recipes are on my Pinterest Boards, so please have a look there also. Your scarf looks great and I'm sure who ever you give it to will love it and will keep them nice and warm. I like the grey strip in it. 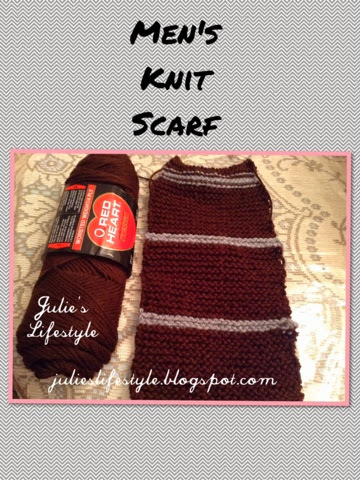 Your scarf is looking wonderful, Julie. The colors are so rich and nice for a man :) Hugs to you, friend! Good evening Julie, the you tube tutorials are diamond, I refer to them quite often myself. It's a good idea to do just a little every day and every day you will be closer to your goal. I also resort to Youtube for help in cooking and crochet. Lots of helpful videos there. The scarf is coming along nicely. I like the addition of a different color. 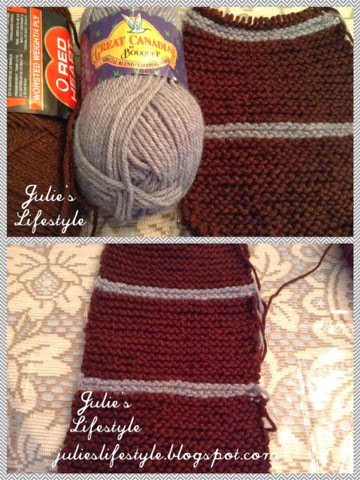 Hi Julie, your scarf is coming along great. I know what you mean, sometimes I try to rush project then you don't enjoy do them. I get excited to see the finish haha. Thanks for linking up to the weekend blog hop..
Hi! Stopping by via Let's Get Social Sunday! Following and would love if you followed back! I'm nominating you for the Liebster Awards... check out my post very soon... you'll be there. I like the gray stripes addition, it adds a touch of elegance to it that is nice! Haha - all your 'male" projects just intensify my guilt! You are really going to make me crochet something for my husband! 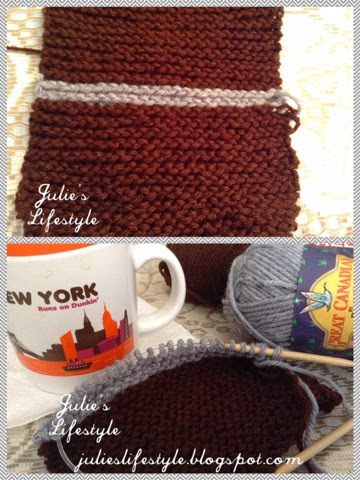 Julie, I really like the addition of the grey stripes! It's going to look great. Thanks for sharing with SYC.